[Dave Birch] Well. 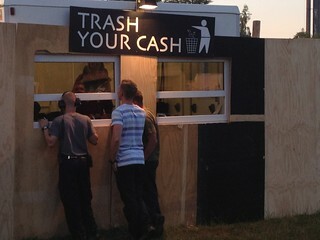 Many thanks to the organisers of the Backstage “Trash your Cash” workshop at the Roskilde festival. 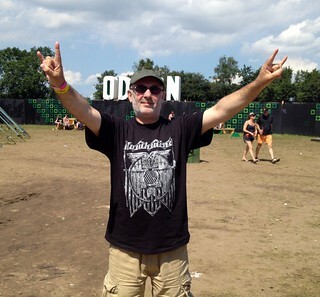 For those of you who are not as down with the kids as I am, Roskilde is one of the six largest music festivals in Europe and has been around for some 40 years. Once every year, the festival becomes the fourth-biggest city in Denmark as around 130,000 festivites show up for days of music and fun! The organisers were kind enough to invite me to come along and join in the seminar and take the opportunity to visit the event as well. What a great weekend it was. I thought I’d better start by heading off to my closet to choose an outfit that would enable me to blend in, so that I could experience the cashless POS environment as just another festival goer. I found a T-shirt emblazoned with the logo of just the kind of popular beat combo likely to be favourites with the crowd of youngsters. Suitably disguised, I went in. One of the first odd things I noticed — other than that no-one else was wearing a Hawkwind shirt — was that there was an enormous queue for the ATM. Hurrah! 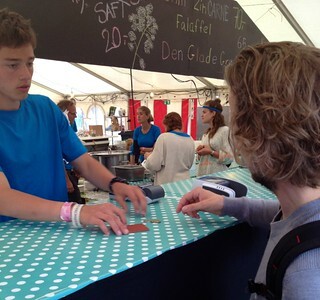 This year Roskilde started going cashless. They had a number of cashless areas and next year, as I understand it, the whole site will be cashless. This year, payment volumes will be around two-thirds electronic and a third cash. The festival has its own closed-loop reloadable pre-paid “festival card”. If you lose your card, tough. 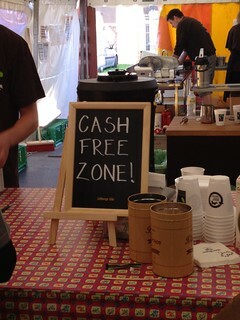 In each cashless area was a “Trash your Cash” booth where you could buy festival cards with cash or bank cards. The festival cards were contactless with a magnetic stripe. I though this was a little odd, but it turns out that it’s an online stored value system and only about a fifth of the terminals had working contactless interfaces, so they kept the stripe. Interestingly, since these terminals also accepted the local PIN debit cards (which, essentially, every single person in Denmark already has) as well as Visa and MasterCard (which, essentially, pretty much all foreign visitors affluent enough to come to Roskilde already have) the organisers only expected to sell a few thousand of the cards. I went off to the nearest booth and loaded up a card with 500 Danish Crowns. Naturally eager to test the system in an operational environment in interests of the wider payments community, I bought a beer with my contactless card and then went off to watch The Cult. 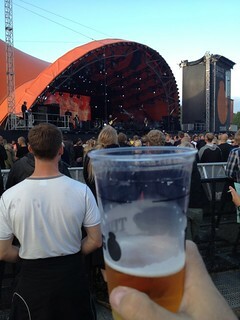 It was quite sunny and I was quite thirsty, so it was soon time to return to the Tuborg tent nearby to make doubly sure that the cards and terminals were still functioning together properly. Hurrah again! Suitably refreshed, I met up with the gang again and we went off to get a snack nearby. There was a ridiculously long line, but that wasn’t because of the time taken to accept cash and provide change. Thrice hurrah! Now let’s be honest. This was the first year, and there were some teething problems. The first POS I went to I naturally tried to pay using an NFC phone and it didn’t work. So I tried a UK contactless MasterCard and that didn’t work either. It turned out that the acquirers can’t process contactless transactions, so chip and PIN worked fine but tap and no PIN didn’t. The closed loop contactless transactions worked fine. However… I did see the system fail (I was told that the host had gone down) completely for a time and I did see several merchants having problems with the terminals (largely, as I understand it, because people kept unplugging the gear in order to charge up their phones!). I found a couple of reactionary stooges using coin of the realm to bypass the temporarily unavailable system, so I took their mugshots and went off to look for some responsible authority to report their anti-social, counter-revolutionary and subversive action to. So it wasn’t perfect. But when it worked, it worked well and without breaching confidentiality on the figures I think I can safely say that the business case is very positive, as we discussed at the seminar, where we heard that the festival has been experimenting with cashlessness for a decade. The costs of cash are visible and absurd. Massive queues at ATMs, shrinkage, labour costs for collection and reconciliation armoured trucks rumbling backwards and forwards, crime (mainly theft from tents and pickpocketing) and, at an international festival, avoiding the need for F/X. Given that these costs are large and visible, it’s no surprise that the festival organisers have been looking at cashlessness for a while. Originally, they were experimenting with SMS payments but this turned out to be uneconomic, largely because the mobile payment guys overcharged. (In fact, one of the other speakers went further and said that had the mobile operators got their act together a decade ago, the festival would have been cashless for the last five years). They also looked at everything from barcodes to internet vouchers while trying to decide when to take the plunge. What changed everything, according to one of the festival managers that I spoke to, was the arrival of contactless payments. The speed and convenience of the contactless interface (and no need for slots, which turn out to be expensive in the festival environment) meant that it was finally viable to consider a fully cash-free environment. 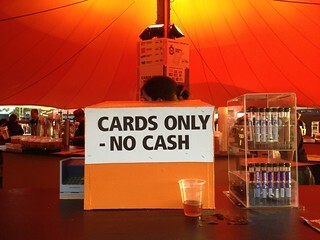 Last year they carried out a limited experiment with exclusively cashless areas (mainly beer tents from what I understood) and this was so successful that this year they decided to evolve further with the large cashless areas where all of the food, drink and merchandising stall are non-cash only. I heard that most of the retailers were happy to go along with this — as long as everyone is cashless they are fine (one of the stallholders told me that he wasn’t really that bothered one way or the other and he said the main determinant of his profit was the bands that were playing). I also heard that (and this is a direct quote) that “The stalls that resisted using cards were the same stalls that had problems with the tax authorities”. As expected. And that was despite the fact that there was a measurable sales uplift over cash during last year’s experiment. Chris Lund-Hansen from Point explained that most festival-goers would actually prefer to use their smartphones for payment but in Denmark there are zero contactless bank cards, no contactless terminals and no issuers. The four mobile operators in Denmark (Telenor, 3, TDC and Telia) have just formed an NFC consortium although they are some way from launching their service. The four Danish network operators have banded together to create a standard NFC platform, and admitted that it is the threat from Google that has driven them to do so. The four networks – TDC, Telenor, TeliaSonera and Three – have banded together to create a standard, SIM-hosted, platform for NFC applications, much like the one announced in the UK last week and in America last November. Anyway, the current festival terminals needed to handle Dancard (the domestic stripe and PIN debit card mentioned above) as well as chip and PIN and contactless. (The retailers, quite naturally, are predisposed to want to accept Dancard because it has fixed fee of about 10 euro cents per transaction.) For Point, this means that the festival is an opportunity to experiment. They put together a system with a single terminal to handle all interfaces, an open API for the retailers to use, standard interfaces to retailer loyalty systems and connections to the acquirers for open loop. They installed 85 contactless terminals and 550 non-contactless terminals and are expecting a few thousand festival cards to be sold. This seemed low to me, but the explanation is, again, that everyone in Denmark already has a PIN debit card and they are perfectly happy to use them. I guess the merchants would prefer to see people go contactless because it would reduce the queues. The mobile imperative is strong. The festival customers are smartphone “leaders” and so the mobile operators have increased the base station capacity by 20 times since last year. (Apparently there were so many customers complaining to their network about poor data bandwidth last year that they are “still processing the cancellations”.) 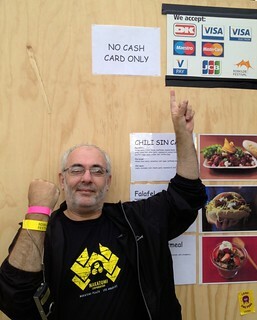 Next year the festival hopes to take cashlessness even more in the mobile direction by allowing people to order and pay for food and drinks on their NFC mobile phone and then go to the food stands just to pick up the meal. (I also heard someone say that if the mobile operators do not provide appropriate base station capacity in the future then the festival will put up its own network). I can hear all you bank dudes and telco bread heads shouting what are the benefits, man, show me the money. It’s interesting to me that the main benefit discussed by the chap who was describing the system to us was not the reduced cash handling, labour costs security spending or anything else to do with the POS. It was the analysis from the data that cashlessness generates. When the festival was all cash, no-one had any idea who was spending what where. That has all changed, and although I don’t want to give away any their ideas, all I will say is that clever use of simple data makes for more a business case than small margins on transaction costs. This point was reinforced during other presentations: there’s a decent business case for removing cash, but a fantastic business case for removing cash and obtaining data. The cards can be “personalised” by SMS which means they can be blocked if stolen. Once again, a simple and cute system: when you get your card, you text the card number with a PIN code of your choice. To block, you just SMS STOP and the card number and PIN. They POS terminals function as balance readers and you can also obtain the balance by SMS. They have also done an experiment with NFC handsets and they expect that mobile will be a much bigger part of the system in coming years. The benefits? Once again, Fruszina said that sales and marketing data was the main benefit and catering data was second. It’s all about the data. Quick service and convenience were on the list too, but further down. It was fascinating seminar and I was privileged to take part with real practitioners openly sharing real data and real results. 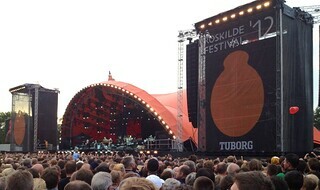 Then we went off to watch Bruce Springsteen and the E-Street Band. I really, really do love my job. One of the services I rather liked, by the way, had nothing to do with NFC. They had an SMS beer service, where you text your location (the different tables had different numbers) and a chap pops round with a beer which is charged to your bill. The system works with company phones too, so if your company has signed up for the service then the premium rate charge for the beer is deduced from your salary at the end of the month instead of being deducted from the phone bill. 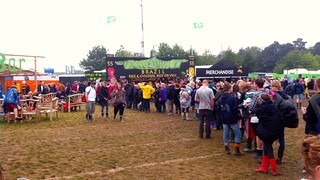 Meanwhile, back in the developing world, my eldest son is about to embark on the UK festival season. He’s over at Guilfest today, seeing (and here’s one for the teenagers) Alvin Stardust. I last saw him stocking up with wellies, beer and (of course) cash. We are a conservative people.